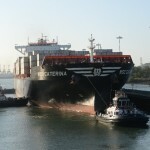 The Panama Canal is set to open the Third Set of Locks expansion project in the second quarter of 2016, which will allow Suezmax tankers, carrying cargoes of up to 130,000 mt or 1 million barrels of petroleum liquids, to transit the waterway, a source said. The current cargo limit is 55,000-60,000 mt. 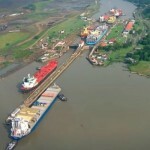 Grupo Unidos por el Canal (GUPC), the consortium responsible for the design and construction of the expansion, successfully completed testing of the reinforcements in sill number three of the expanded Pacific locks earlier this week and less than 4% of the overall project work remains to be completed, according to the canal operator, the Panama Canal Authority. The canal expansion is expected to be inaugurated later this year, it said. Repairs to a large crack at the third set of locks, which first appeared in August 2015 at the concrete sill between the lower and middle chamber of the Cocoli locks, have been fixed, it said. 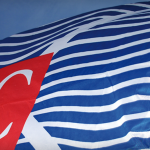 “We expect to be operational in the second quarter of 2016,” a PCA source told Platts Friday. Once the expansion is completed, the draft for vessels transiting the canal will increase from the current 39.05 feet in the old locks to 50 feet in the new locks. While the PCA does not limit deadweight tonnage, the expanded locks can accommodate larger size vessels, as maximum beam increases from 106 feet to 140 feet and overall length (LOA) from 965 feet to 1,200 feet, according to the PCA source. At a draft of 50 feet, liquid tankers can carry cargoes of up to 130,000 mt or up to Suezmax size, more than double the current capacity of 55,000-60,000 mt, depending on the shape of the ship. For the transportation of LNG, only Q-Flex and Q-Max size vessels, two new classes of LNG tankers capable of carrying 210,000 cubic meters and 266,000 cu m of LNG, respectively, are excluded. 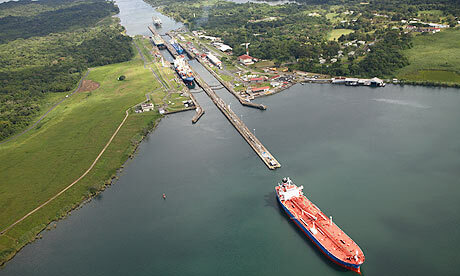 LPG vessels, including VLGCs, capable of carrying 500,000 barrels of LPG, will fit through the new locks, the ACP said. The expansion project includes the construction of two new post-Panamax lock complexes, one each on the Atlantic and Pacific ocean side. 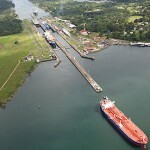 The project will also raise the maximum operational level of Gatun Lake, a large artificial lake to the south of Colon that allows ships to transit across the Isthmus of Panama, from a current elevation of 26.7 meters price-level datum, based on main sea level calculations, to 27.1 meters PLD. 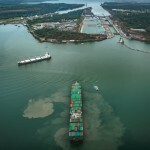 The expansion will deepen the navigational channel within the lake and in the Culebra Cut, which forms the narrowest section of the canal channel outside of the locks, widen the two entrances to the waterway, and deepen an access channel that will connect the new post-Panamax locks on the Pacific side to the Culebra Cut.